Saint Euthymius of Suzdal was born in the year 1316 at Nizhni-Novgorod. From early childhood he was taught his letters and received a spiritual upbringing. He received monastic tonsure at the Nizhegorod Caves monastery under its founder, Saint Dionysius (later the Archbishop of Suzdal, commemorated June 26 and October 15). The ascetic struggles of Saint Euthymius were so great that Saint Dionysius advised him to lessen them. In 1352 Prince Boris of Suzdal sought to establish a men’s monastery in his city, and he requested the Nizhegorod Caves monastery to send a monk to establish the monastery. The choice of the saintly igumen fell upon Saint Euthymius. After the arrival of Saint Euthymius in the northern part of the city beyond the Kamenka River, Saint John of Suzdal (October 15) set up a cross on the site of the future monastery cathedral before a tremendous crowd of people. The prince himself began to dig the ground for the foundation, and Saint Euthymius made three grave stones for himself, vowing to remain in the new monastery until the very end of his life. So, the the Savior-Euthymius monastery was founded, where soon more than three hundred monks gathered under the guidance of the saint. The monastery adopted the cenobitic rule. The saint insisted that each of the monks be prepared to fulfill whatever obedience they were given. 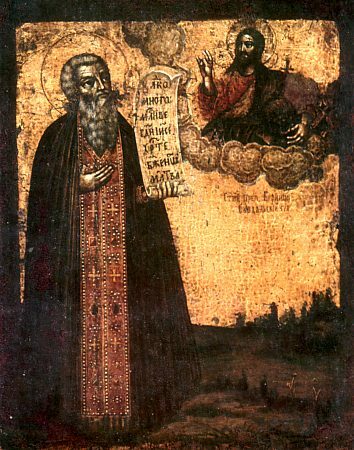 Saint Euthymius went often to the Trinity-Sergiev monastery to Saint Sergius of Radonezh (September 25 and July 5). Saint Euthymius was a strict ascetic and a great man of prayer. He toiled incessantly for the benefit of all the brethren. Saint Euthymius died on April 1, 1404. On July 4, 1507 while a foundation trench was being dug for a new cathedral church, his incorrupt relics were uncovered. The saint was glorified at a Council in 1549. Яко светозарная звезда,/ пришел еси от востока на запад,/ оставив отечество твое, Нижний Новград,/ и, дошед богоспасаемаго града Суждаля,/ в нем обитель сотворил еси,/ и собрал еси монахов множества,/ и, прием дар чудес от Бога, отче Евфимие,/ был еси о Христе собеседник/ и спостник преподобному Сергию./ С нимже у Христа Бога испроси нам здравие, и спасение,/ и душам нашим велию милость. Волнений множество невлажно преходя,/ безплотныя враги струями слез твоих погрузил еси,/ Богомудре Евфимие преподобне,/ тем и чудес дар приял еси,/ моли непрестанно о всех нас.